The one-man committee probing into the affairs of the Indian Institute of Advanced Study has found serious administrative irregularities and more damning evidence of ‘saffronisation’ which plunged the academic reputation of the prestigious centre to an “all-time low”. The Chief Minister of Himachal Pradesh, Mr Virbhadra Singh, said today that 2,500 middle schools would be opened in the next two years in order to make elementary education compulsory in the hill state. 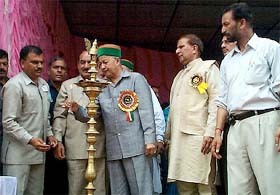 Chief Minister Virbhadra Singh lights jyoti to inaugurate the 2nd Conference of Shikashak Vichar Manch in Mandi on Monday. Activists of the CPM today staged statewide protests against the steep hike in the electricity tariff for domestic consumers announced by the state Electricity Regulatory Commission. Terming the hike in power tariff as inimical to the growth of industry in Himachal Pradesh industrialists are contemplating a review petition to challenge the exorbitant new rates. In video: The Dalai Lama begins 10-day sermons in Dharmshala. With floods of “unlikely probability” becoming a frequent phenomenon in the Sultlej, a big question mark has been put on the future of the seven big hydro-electric projects coming up upstream and downstream the 1500 MW Nathpa Jhakri project on the highly turbulent river. With most of the stranded persons have been evacuated from the flood-affected areas of Kinnaur, the crucial phase of the rescue operation is over but the administration is now worried about the transportation of peas crop. The Pathankot-bound 4PBJ passenger train was derailed this evening near Baijnath when a big tree fell on the running train, leaving two passengers injured, railway sources said. Hordes of excited students screamed away as Bollywood actors Akshay Kumar and Kareena Kapoor kicked off the shooting of “Dosti” with a romantic duet at a convent school here. The one-man committee probing into the affairs of the Indian Institute of Advanced Study (IIAS) has found serious administrative irregularities and more damning evidence of ‘saffronisation’ which plunged the academic reputation of the prestigious centre to an “all-time low”. In its fourth and the last interim report submitted recently Dr D. Bandyopadhyaya Committee had pointed out that out of the 22 national seminars organised over the past three years as many as 14 were regarding Indian civilisation and related issues. Most of the proceedings of these seminars were not published which showed that the authorities of the institute were aware of the poor quality of the deliberations. The committee observed that it was a clear misuse of public money. Besides, the seminars should have covered all areas of study mentioned in the memorandum of the institute. Further, the participants were invited at the whims and fancies of authorities. This is evident from the fact that out of the 22 invitees to a national seminar on “Contemporary Relevance of Smriti” held at Allahabad Museum as many as 19 were from Allahabad itself. In another case the institute gave Rs 2 lakh to the Akhil Bhartiya Veda Raksna Samiti, a Delhi-based organisation, in February 2004 for organising a collaborative “Akhil Bharatiya Vedic Sammelan”. The committee found that the amount was paid without any scrutiny and there was nothing academic in the entire event. It was a propagandist venture to promote consciousness of Vedas among Hindus. The director of the institute had no powers to fund a totally non-academic religious function. The biggest item of expenditure was gifts to Vedic scholars, consisting of shawls, blankets and cash. Among the prominent persons who attended the sammelan, included former Prime Minister A.B. Vajpayee, former Union Minister, Murli Manohar Joshi and Shakaracharya Swami Jaynendra Saraswati who was subsequently arrested on a murder charge. “Besides 22 national seminars 36 seminars were held in collaboration with the other institutions and the total expenditure was Rs 75 lakh. But surprisingly not a single book on proceedings was published to enhance or enrich our level of knowledge” the committee observed. The interim report had severely indicted the Director of the institute, Dr Bhuvan Chandel, for various administrative and financial irregularities like making foreign trips without getting clearance from the Union Ministry of Human Resource and Development, remaining away from the office for most of the time and running her own publishing house in the name of Kalki Prakash. With this the probe has been completed and the consolidated final report is likely to be submitted by next month. The Chief Minister of Himachal Pradesh, Mr Virbhadra Singh, said today that 2,500 middle schools would be opened in the next two years in order to make elementary education compulsory in the hill state. He was addressing a gathering of teachers during 2nd conference of the Shikashak Vichar Manch at Mandi today. He said the number of educational institutes had already reached a saturation point and now the government would try to improve the quality education. And in order to impart compulsory elementary education new middle schools would be opened on need basis. He further added that Rs 25.77 crore would be spent on improving and constructing science labs at various senior secondary schools throughout the state. The government had already imposed ban on transfers of teachers in order to improve the quality education except on disciplinary grounds. It has also introduced English in government schools from first standard this year, he added. The Chief Minister urged teachers to help in eradicating social evils from society. The B.Ed classes would start at Government College, Mandi, from this academic session and new building would soon be constructed on the campus. He gave Rs 1 lakh from his own account for renovating two mosques which were damaged by some miscreants last month. The decision regarding the implementation of professional tax would not be reviewed. The agitation of advocates regarding the abolition of professional tax was unjustified and backed by political parties, he added. Mr Chuni Lal, President, Shikashak Vichar Manch, read out various demands of teachers and urged the Chief Minister to raise the retirement age of teachers from 58 to 60 years. Besides criticising the Congress, the party also lambasted the BJP for making a hue and cry on the issue. The BJP, it said, had no moral right to condemn the hike as its government enacted the Electricity Regulatory Act in 1998 and the commission was set up in 2001. The Congress had also supported the Bill in Parliament. Though the commission had full authority to determine the tariff, it was apparent that the domestic consumers, who accounted for about 13 lakh out for the total 16 lakh consumers, were at the receiving end. While the domestic tariff had been more than doubled, the charges for industrial consumers had been reduced. The commission had earmarked over Rs 13 crore for publicity campaign which was not justified. The activists held a procession from Lower Bazaar and later held a rally in front of the Naaz restaurant. The speakers suggested that instead of burdening the consumers the government should increase royalty in hydroelectric projects from the existing 12 to 15 per cent and make efforts to secure its share in the inter-state projects, the arrears of which amounted to Rs 4,600 crore. Protests were also staged at various district headquarters and major towns of the state. Terming the hike in power tariff as inimical to the growth of industry in Himachal Pradesh industrialists are contemplating a review petition to challenge the exorbitant new rates. Exposing the claims of the state government of Himachal being a power surplus state the investors opined that the new tariff had slapped rates higher than those prevalent elsewhere in the region. The Baddi-Barotiwala-Nalagarh Industries Association, while expressing concern over the revised rates, said the tariff order was against the expectations of the industry. With a steep hike in demand charges for all categories of industrial consumers varying from 20 to 200 per cent, the industrialists opined that such high charges were neither demanded nor discussed by the state electricity board during its hearings. The worst-effected would be the consumers requiring HT and LT lines. The cost per unit of power would now go up by 15 to 30 per cent. Not only this a reform surcharge of 5 per cent would further discourage investors, opined Mr R.S. Guleria, president of the association. Normally hydro-electric projects are designed for the highest flood probability of one in 100 years to one in 1,000 years. However, floods of much higher probability have occurred twice within a gap of five years. With the Parechu lake still there and the creation of more such natural lakes by landslides in the fragile high mountain ranges becoming a distinct possibility, the probability of such devastating floods has only increased. Hydro power experts will have to recast their strategies while designing the projects, particularly those upstream Nathpa. These include Khab-I, Khab -II, Jhangi-Thpoan, Thopan-Powari and Karcham-Wangtu. Besides, the Rampur and Luri projects are coming up downstream Jhakri. Work on the 1000 MW Karcham-Wangtu and 434 MW Rampur projects is underway, and the Khab and Luri projects have also been assigned to the Sutluj Jal Vidyut Nigam (SJVN). Keeping in view the turbulent nature of the Sutlej and the fact that most of its catchment area falls in the seismic zone, the design for the Nathpa-Jhakri project was based on flood probability of one in 10,000 years. The highest discharge in the river during such an eventuality was calculated to be 5,650 cumecs (cubic metre per second). Unfortunately, the extra care taken by the technocrats in designing the project did not help as the flood, the probability of which was estimated to be one in 61,000 years, occurred in August 2000 even before the project could be completed. The maximum discharge recorded was 6,500 cumecs, 850 cumecs more than the highest discharge for which the project was designed. Last week’s breach in the Parechu caused floods, the probability of which was estimated to be one in 5,000 years. The maximum discharge during the flood was 4,500 cumecs at Nathpa and 5,000 cumecs at Jhakri. With each such event the probability of such devastating floods is increasing and it had to be taken into account while designing projects, says Mr Ranjodh Singh, veteran hydro expert and consultant for the SJVN. A survey conducted by the district administration revealed that about 18,000 tonne of peas will be produced in the areas that have been cut off due to disruption of road links. Since airlifting of produce will be an uneconomical proposition, the administration has sent a proposal to the government for the transportation through spans and transshipment. The additional expenditure on this account shall be provided as subsidy to the farmers. Spans have already been put in place at five places. Alternatively, the government could purchase dried peas from the farmers at remunerative rates so that they do not suffer any losses. The total value of the produce has been put at Rs 24 crore and the failure to market it could ruin the economy of local tribals. Meanwhile, 30 more persons, including seven foreigners, were evacuated from Youngthang and Pooh. SP Arvind Sharda said around 12 tourists were still left in the Nako area. Work on the old Hindustan -Tibet road has been speeded up and it would be through for light vehicles from Peo to Tapri over the next one week. The Thopan-Powari road is also being restored to provide link to the Jangi-Lipa area. The 1500 MW Nathpa Jhakri project remained closed for the tenth consecutive day. Power generation could not be resumed due to high silt content in the Sutlej. While the discharge in the river came to normal at 1200 cusecs, the level of silt was still more than 12,000 ppm (parts per million). The project has been designed for a maximum silt level of 5,000 ppm. When the train left Baijnath station for Palampur, a big tree fell on the second coach, resulting in derailment of the train. Two passengers were injured in the accident. According to the Railway sources at Baijnath, the traffic on the track was disrupted and all the trains coming from Pathankot to Jogindernagar were terminated at Palampur. Girls from Jesus and Mary School and the adjoining St Bedes College shouted excitedly as the shooting of the song continued. “The film also stars Bobby Deol, Lara Dutta and Juhi Chawla. It is expected to be released by Divali this year,” said director Sunil Darshan. Later, the two actors mixed around with wide-eyed girls of St Bedes. “I do not have any plans of marrying for the next seven to eight years,” said Kareena. Akshay Kumar, who has been around for several years in Bollywood, revealed: “‘Waqt’ and ‘Jaanwar’ are my favourite movies so far. ‘Family’, my sixth film with Amitabh Bachchan, is scheduled to start.” “I am proud to have become a star without a godfather, but luck is equally crucial,” added Kumar. The Himachal Pradesh Administrative Services combined competitive (preliminary) examination, 2004, will be conducted at the examination centres located in Shimla, Solan, Mandi and Palampur on August 7, 2005, according to the Secretary of the state Public Service Commission. He said the admission letters to all the provisionally admitted candidates were being dispatched. The candidates who did not receive the same by July 30, 2005, could contact the commission. Interviews for the posts of primary teacher in Kangra subdivision, fixed for July 5, have been postponed till further orders. Disclosing this here today, the SDM, Mr R. Selvam, said the new dates would be announced later. The Barog panchayat has criticised the IPH Department for its failure to improve the potable water supply condition in Barog. At a panchayat meeting yesterday, they said the field staff paid no attention to their problem. The non-availability of potable water was a chronic problem here but the situation turned alarming during summer. Sanjay Kumar, up pradhan of the panchayat. Over 700 residents of Barog were only managing to get a single bucket of water from the past three months, he maintained. The water level in the 50,000 litre capacity water tank had only about 3 feet.